NASA managers Wednesday cleared the shuttle Atlantis for launch May 14 on its 32nd and final planned flight, a three-spacewalk mission to the International Space Station. The primary goals of the flight are to replace aging solar array batteries, install a backup Ku-band antenna and attach a new Russian module loaded with supplies and equipment. "We had a very thorough review today, we went through all the things that have happened on the vehicle, both the shuttle and also the station," said Bill Gerstenmaier, NASA's chief of space operations. "We're ready to go fly." Launch is targeted for 2:20 p.m. EDT on May 14, roughly the moment when Earth's rotation carries launch complex 39A into the plane of the space station's orbit. NASA's processing team at the Kennedy Space Center has one day of contingency time left in the current schedule and can make four launch attempts through May 18. If Atlantis isn't off the ground by then, the flight likely will slip to late June because of conflicts with other launches and periodic temperature issues related to the space station's orbit. "It was a very smooth flight readiness review," said shuttle Program Manager John Shannon. "I am amazed at this team because (the shuttle) Discovery did just land 15 days ago. We're the beneficiaries of its very trouble-free mission. Atlantis has had a very trouble-free processing flow." But Shannon said NASA managers attending an executive-level flight readiness review did go over two issues related to Discovery's flight. Discovery's Ku-band antenna system failed shortly after launch, limiting data relay, radar operations and live video from the orbiter. After landing, the problem was traced to a specific transistor and while the same components are in place in Atlantis' Ku-band system, the odds of a similar failure two flights in a row are considered remote. Engineers also reviewed work to better secure ceramic inserts, or plugs, that are threaded into place over bolts used to hold specific heat shield panels, window frames and other components in place. An insert worked its way loose during Discovery's re-entry, posing a potential impact threat. Shannon said the inserts around Atlantis' windows and forward rocket pod were tested and re-installed using a thicker braided cord intended to increase friction and make it more difficult for a plug to back out. "The tone of the meeting was extremely positive," Shannon said of the flight readiness review. "Nobody mentioned, and it wasn't purposefully avoiding it, but nobody mentioned this was Atlantis' last planned flight. Folks are so focused and doing their jobs and performing with such pride all the way to the end, it's just normal business. "You might ask, well did you really have to go and replace all the braided cord on all these plugs which have performed pretty well in the past? And the answer is, we think we'll make it better and because it'll make it better, we're going to go do it. That's the kind of attitude this team has. Their such an asset to human spaceflight and I could not be more proud of them. "So we're ready to go next Friday," he said. "It's 15 days since we last landed, nine days until we launch. This is the kind of pace this team thrives on." Launch Director Mike Leinbach said the shuttle's processing was following a standard flow, with no major changes because it's Atlantis' final planned flight. "I was just looking at the previous missions of Atlantis and reminiscing a little bit," he said after the FRR. "Yeah, she's been around a long time and a lot of us have known that ship for 25 years. So it'll be bittersweet to be sure. She's flown 31 times already, 115 million miles ... about a third of her design life. "But our mission is coming to an end, so we're coming to grips with that. The team is very professional. We know it's the last one, probably, but that doesn't affect the way we process or launch this thing. We're going to do it safely and surely and we hope we do it next Friday." Assuming an on-time launch, commander Ken Ham will guide Atlantis to a docking with the space station's forward port around 10:27 a.m. on Sunday, May 16. The next day, the crew will stage the first of three spacewalks to install a spare Ku-and antenna dish, six replacement batteries for the station's oldest set of solar arrays and an equipment mounting plate for a Canadian robot arm extension. The Atlantis astronauts also plan to install a Russian module on the Earth-facing port of the Zarya module. The 17,400-pound mini-research module, or MRM-1, will be launched loaded with more than 3,000 pounds of NASA supplies and equipment. MRM-1 will provide better clearance between visiting Progress and Soyuz spacecraft and a NASA storage module that will be attached to the station just in front of Zarya later this year. MRM-1 will be attached to the station on May 18, the day after the crew's first spacewalk. The next day, a second spacewalk will be staged to begin the battery replacement work. A final spacewalk is planned for May 21 to complete the battery swap outs. If all goes well, Atlantis will undock from the station around 11:20 a.m. on May 23 and land back at the Kennedy Space Center around 8:44 a.m. on Wednesday, May 26. "This is a very exciting mission," Shannon said. "Twelve days, three EVAs, tons of robotics, we're putting on spares that will make us feel good about the long-term sustainability of ISS, we're replacing batteries that have been up there for a while, docking a Russian-built ISS module. This flight has a little bit of everything." NASA managers originally planned to launch the shuttle Endeavour July 29 on a mission to deliver a $1.5 billion physics experiment to the station and to close out the shuttle program with a final flight by the shuttle Discovery on Sept. 16. But the powerful magnet at the heart of the Alpha Magnetic Spectrometer slated for launch aboard Endeavour is being replaced and NASA does not expect to launch Endeavour before late November at the earliest. If the shuttle misses a short launch window, the flight could slip to late February. 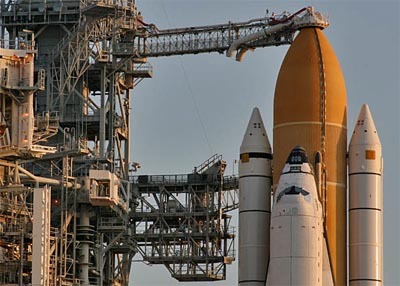 Whenever Endeavour takes off, Atlantis will be on standby for a rescue mission in case of any major problem that might prevent Endeavour's crew from safely returning to Earth. Because an external tank and boosters will be available for the so-called "launch-on-need" mission, NASA managers have held open the possibility of launching Atlantis and a reduced crew of four on a final mission to the station next summer to deliver additional supplies and equipment. A four-person crew could, in theory, rely on Russian Soyuz ferry craft to eventually make it home in an emergency. Whether NASA can pay for an additional mission, or win the political support that would be necessary, remains to be seen. But Gerstenmaier said Wednesday a decision one way or the other was needed by the end of June.